Hurricane Harvey hit Texas Friday night as a Category 4 storm, a monster that had gained power all day and caused numerous warnings and evacuations along the coast from Corpus Christi to Houston. The eye of the hurricane wet ashore at Rockport, Texas, a small beachfront city of 10,000. 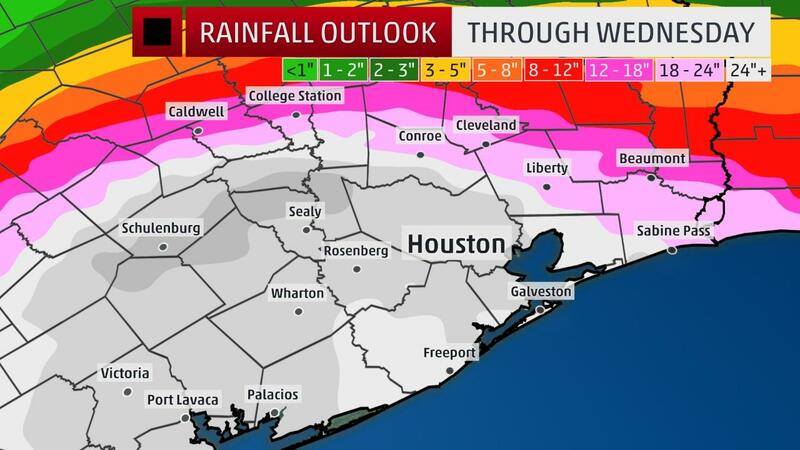 As of Saturday morning, San Antonio and the capital city of Austin, where I have a vested interested because it’s where my sister and her family live, were not in the path of destruction but, as weather conditions tend to be, the unexpected can become the expected so all are on alert. Ten years ago this week we were dealing with equally hot and dry weather so while looking back through the archives, I came across this adventure. From July 27, 2007…. It was hot today in the Valley although very breezy — a hot breeze. I was outside working in the yard most of the day … weeding and deadheading flowers, trimming forsythia bushes and getting sweaty and tired … and the sun was hot. A late-afternoon thunderstorm ran me inside only to leave us with only thunder, lightning, and wind while all the rain went north of here. When I went back outside after dinner to water my flowers, SWAC Husband was watering the tomatoes in the garden. 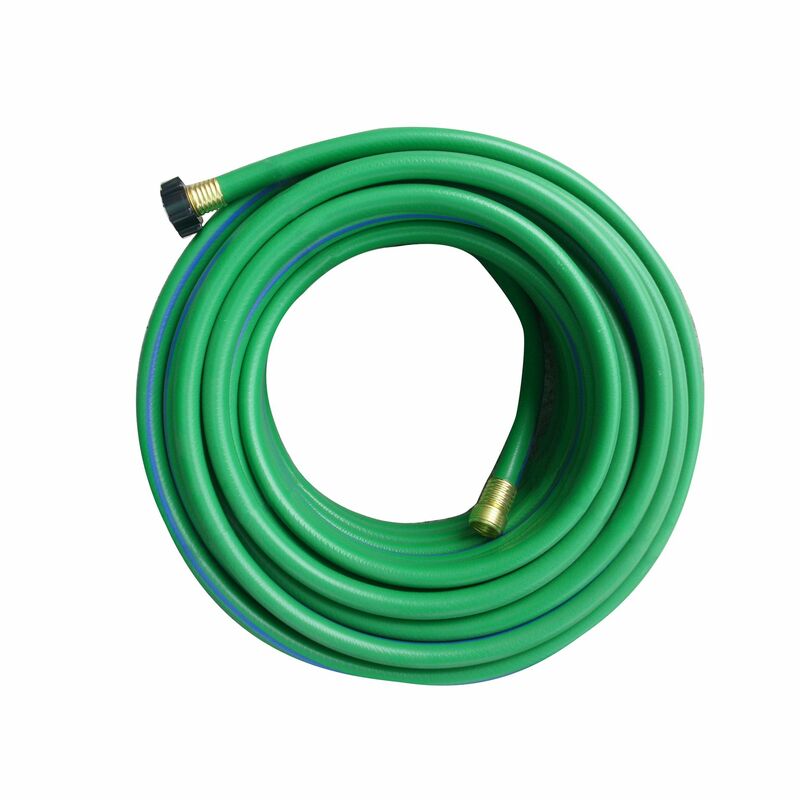 I noticed a substantial leak in the hose so decided to try and scoot the leaky section to the garden so all that water would go on vegetables … except the hose didn’t cooperate. It twisted and turned and twisted again like a snake … I jumped and screeched and tried to throw it over the fence … it twisted back on me — yowie, that water was cold! — and … well, let’s just say I’m watered from head to toe! Next time I’ll turn off the hose first. Got my towel; now I need to go outside and get back to work…. The first day of Spring arrived at 6:29 this morning and, in Virginia, it comes after a lackluster winter that saw little snow and wildly fluctuating temperatures with plenty of spring-like days. This first day of spring is brought to you by the animated spring equinox Google doodle. Click here to see the latest in a line of creative entertainment from the premiere search engine — but hurry because it will only be there one day — March 20, 2017. Spring equinox marks the time of year when day and night are equal — 12 hours each — and then days become longer until the summer equinox on June 21. This year it offers the pleasing nugget of being on a Monday. Kind of take the edge off this first day of the week, doesn’t it….? Spring flowers, spring temperatures, spring sunshine, spring cleaning. Do you want to build a snowman? Hunker down because some who live in the path of the impending March nor’easter named Stella could see up to two feet of snow, and substantial amounts have been predicted along the East Coast from New England through the Carolinas. With such high snow totals, it’s sure to be boom or bust, depending on location. In Virginia, the predicted snow comes on the heels of a relatively mild winter that seemed to have more up-and-down temperatures than usual. With the first day of spring a week away, this wintry forecast may seem like a cruel joke but it is March in Virginia so nor’easter blizzards are not unusual. It’s worth noting that Stella is on a similar path as the March 11-13, 1993, winter “Storm of the Century” that hit the East Coast twenty-four years ago, causing 310 deaths, billions of dollars in damage, and had record low temps as well as thundersnow, extra high winds, and tornadoes. Stella is not predicted to be a repeat of 1993. As a sad side note, Washington, D.C.’s famous cherry blossoms, expected to peak this weekend which is early because of the warms temps of winter 2016-17, are in danger from winter conditions that are the harshest since record keeping began in 1921. 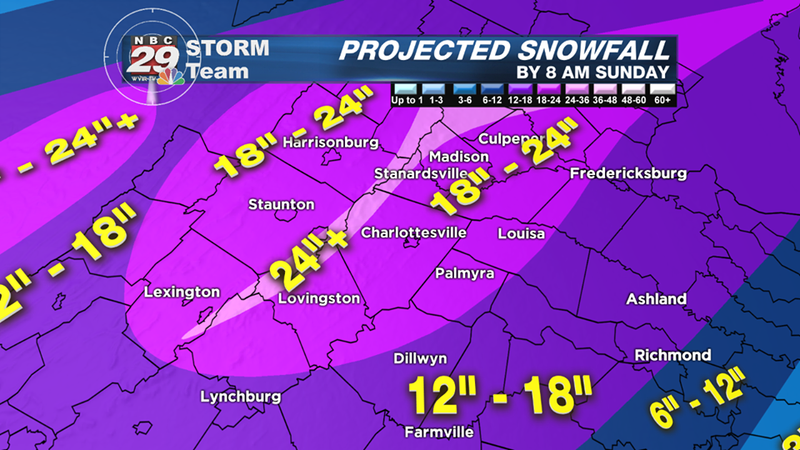 Northern Virginia and the nation’s capital have the potential to see up to a foot of snow. At our house west of Staunton in the central Shenandoah Valley of Virginia, we are under a winter weather watch. The forecast as of Monday morning was suggesting we are in the path for 4-8 inches of snow that will begin between 6-8pm, high winds, and overnight lows in the 20s. Temps through Thursday are expected to top out at daytime highs in the low- to mid-30s with overnight lows in the teens. Areas north of here are expecting much more wintry precipitation. The National Weather Service as well as numerous weather outlets will be updating throughout the storm. The Weather Channel’s head meteorologist Jim Cantore was in Boston on Monday with a platoon of other TWC weather watchers on location through the storm area. Wherever you are, and whether you’re expecting snow, rain, or nothing at all, be safe and keep a weather eye to the sky. Delegate Steve Landes’s office (R-25th House District) sent out an extreme heat advisory Tuesday morning as a strong of summer temperatures in the upper 90s continues. Stay cool! The extreme heat impacting the Commonwealth continues. It is important to take the appropriate steps to keep you and your families safe. To that end, I wanted to provide you with some helpful links and resources, which you’ll find below and on my website here. Stay tuned to local media outlets for weather information and school closings and delays. The Greenbrier’s owner, Jim Justice, announces they will reopen on July 12, 2016. The Greenbrier Resort, that stately National Historic Landmark tucked away in the West Virginia mountains but known to travelers from around the world, reopened Tuesday. It had been closed for more than two weeks after devastating floods hit the Mountain State when a series of thunderstorms dumped 10-12 inches of rain that swelled rivers and streams. Though the Greenbrier had closed its doors to the public when flood waters destroyed its iconic Old White golf course and damaged other areas of the property, it provided rooms and meals to more than 700 who had been left homeless until a shelter could be set up by the state. It also acted as a drop-off and pick-up point for donations as residents in neighboring states and businesses pitched in to help the thousands in need. The National Weather Service called June 23 a once-in-a-thousand-years flood. Twenty-three people lost their lives, 51 of 55 counties were declared disaster areas, and 1,500 homes were destroyed while 2,000 others were damaged. The fatality count includes a 14-year-old girl whose body has never been found, a harrowing experience shared by her father of fast-rising flood waters that washed her away leaving family members clinging to life for nine hours in the raging. The resort’s reopening gives hope while clean-up continues. Help is still needed — some have lost everything. Meanwhile, the New Orleans Saints are heading to White Sulphur Springs for training camp at the end of July — a fan favorite the past two years — and in September the Greenbrier Tennis Classic is on tap. All will help bring badly needed normalcy back to West Virginia. As of Sunday, 25 lives had been lost. 44 of 55 counties in West Virginia are under a state of emergency, mostly in the southeastern area. Greenbrier, Kanawha, and Nicholas counties’ residents qualify for Federal Emergency Management Agency aid after West Virginia was declared a federal disaster area. The Greenbrier Classic PGA tournament, scheduled for July, was cancelled after the Greenbrier Resort’s golf course was destroyed by flood waters. In Kanawha County, a temporary gravel road was built to rescue 500 people trapped when the bridge crossing was destroyed by flooding on Thursday. Thousands are still without power. More than 60 secondary roads were still closed as of Monday. An estimated 8-10 inches of rain led to the massive flooding. Greenbrier Care Family Practice is giving away hundreds of free tetanus shots; free water is being distributed; Americans are stepping in to help. 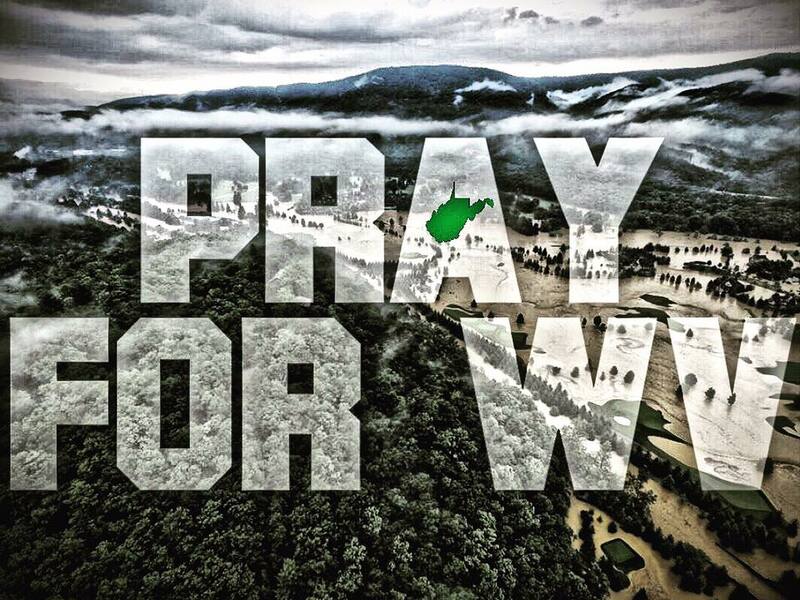 Anyone interested in helping West Virginia is asked to contact the Greenbrier County Emergency Shelter at 304-645-6999 or mail monetary donations to 3584 Davis Stuart Road, Lewisburg, WV, 24901. Non-perishable food items can be dropped off at The Greenbrier at The Greenbrier Sports Performance Center, just across the street from the main property on Kate’s Mountain Road. Donations can also be made online at http://www.therhemalife.com, or by texting the amount you wish to give and the word “neighbor” to 501-697-4362. In Augusta County, a drop-off point for donated items is Augusta Health Care for Women, 39 Beam Lane, Fishersville. Their office administrator’s WV home town is flooded. This is the list of needed items. West Virginia Senator Joe Manchin updates are here. West Virginia is our neighbor to the west with family, friends, and fellow Americans who are dealing with tragedy, devastation, and a clean-up that will last days, weeks, months, and perhaps years. It’s clear to me that there are still people that don’t grasp the magnitude of what we have experienced on the West end of Greenbrier County. I am receiving messages from people and being approached by people who may not get it. There are still people stranded in homes awaiting rescue. People have been without food or water for over 24 hours now. Many are displaced without important medications. Some have lost everything and have yet to even find their loved ones. But our little communities have come together like no other. Police officers and fireman have been working tirelessly for 36 hours straight. We are feeding the hungry, clothing those that we can, checking on each other and helping as best we can. This is not about a delayed golf game. It’s not about the loss of cars or trucks. It’s not even about the homes or buildings anymore. It’s about the people! The human beings. Who can we save and how can we care for them?! Let’s survive this and help as many as we can. Let’s be strong and carry on. That’s what WV does. That’s who we are. We are survivors and we are strong. We will carry on and we will carry each other. People are sending me an overwhelming amount of messages and they all say “thank you for what you’re doing.” Just for the record, I am not to be thanked. I am doing what any red blooded, God fearing, West Virginia girl would be doing at a time like this! I just happen to have resources to tap into and awesome people to help me. I am not alone. God has sent me dozens, if not hundreds, of wonderful people and helpers that are the ones making everything possible. I love my home town and I love the people. I am doing what I love. HELPING PEOPLE! I don’t need to be thanked. The real heroes are the ones that swam in freezing water to save lives; the ones who searched and rescued humans; the ones who got up today and shoveled their lives into trash bags and began to start over; the ones who are grieving loved ones and the ones that still haven’t been rescued yet. Those are the heroes, the ones that are to be recognized and thanked! To God be the glory for all the rescue and relief effort! Thank you to all those helping and recovering. I love you all! I love Greenbrier County and I love all the people sending aid in. Together we will recover and Greenbrier County will rise again! Today marks a special day for astronomy enthusiasts. The summer solstice and June’s strawberry moon will coincide for the first time in nearly 70 years. Go look at it. Chances are you won’t be around when/if it returns in 70 years. At 2:26AM Wintergreen Fire & Rescue was dispatched to assist a female hiker on the Appalachian Trial in the area of Spy Rock Mountain. The high winds had blown down an approximate 30″ diameter tree which fell on her while she was sleeping. While traveling to the trail head, units encountered a downed tree completely blocking the Parkway which they had to cut and remove. Crews used a specialized transport ATV to get as close as they could; however, [they] had to hike the final mile +/- on foot using a basket to carry the patient. Her fellow hikers had already extricated her from beneath the tree upon arrival of rescue crews. She arrived at the hospital at approximately 6:00AM. While crews were preparing for their hike out, the hikers pointed out what they believed to be a mountain fire. Sure enough … currently Piney River Fire, Wintergreen Fire, and the Forestry Department are working to contain. The winds have subsided today but downed trees and fire continue to pose problems. Be safe out there…. This is the view today in Shenandoah National Park at Big Meadows. Growing up, we spent many fun-filled days at this campground, exploring and hiking in God’s sanctuary. 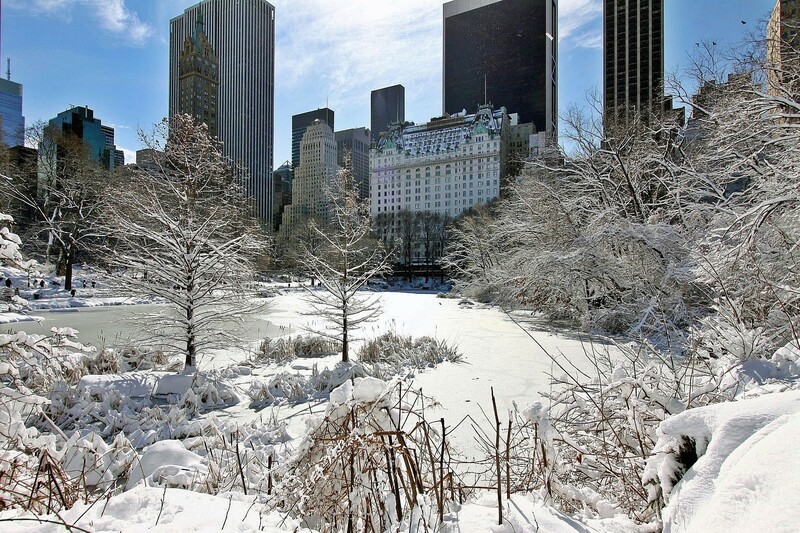 Today the park embraces winter … the quiet, peaceful beauty of the mountains covered in a snowy blanket of white. February 9, 2016. Big Meadows web cam the morning of February 9, 2016. It is truly beautiful in the park today! 8:30am: Good morning from my snowy corner of the world west of Staunton. 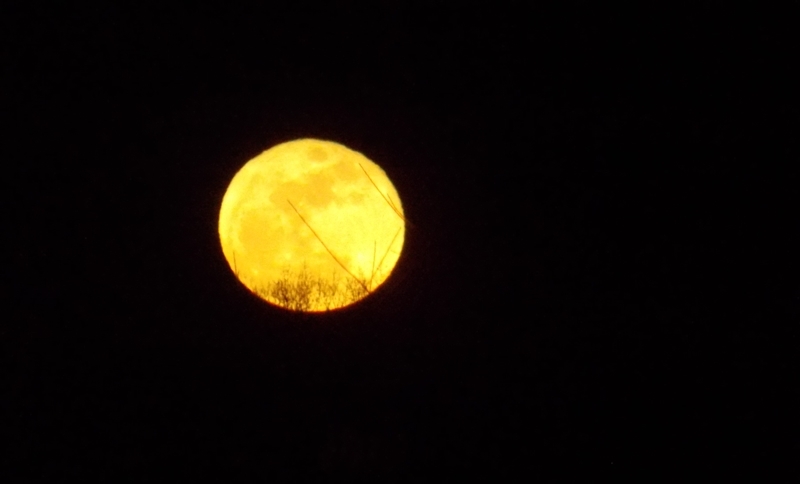 It was a frigid 10 degrees overnight with clearing skies after the snowstorm moved out, and a full moon. There’s between 18 inches and 3-4 feet of snow (from drifting) … a winter wonderland with snow-flocked trees and piles of the white stuff along the road and driveway. The snowplows came through in the middle of the night to clear the road. Our thanks to VDOT. And our thanks to Dominion Virginia Power for their part in keeping the lights and heat on through the blizzard. By this time yesterday we had been up for 3.5 hours as the snow continued to fall and the wind howled. Today we have awakened to a cold sunny morning after the full moon came out overnight and illuminated everything. I woke up briefly sometime in the early hours to see the moon and then went back to sleep. Our neighbor — bless his heart — is out there again clearing our driveway for the third time during this storm. Today neighbors will check in on each other, clear driveways, and make sure everyone is okay. 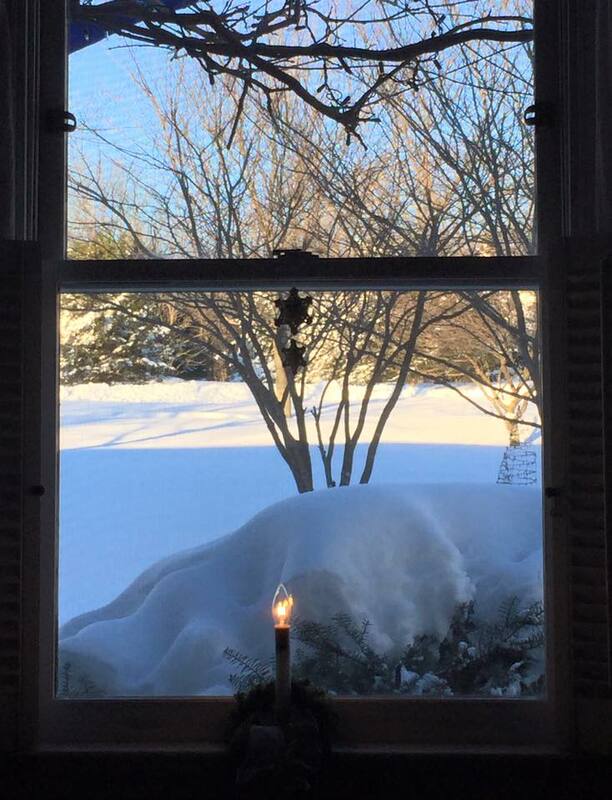 See also Live-blogging the January 22-23, 2016, historic Virginia snowstorm with photos from around Virginia of Friday’s snow. Day 2 of the Blizzard of 2016 in our corner of the Shenandoah Valley: We’re not going anywhere with the forecast calling for heavy snow to continue all day along with high winds and temps in the 20s. Our neighbor made two runs at the driveway yesterday so I suspect he will be back his morning in his effort to prevent the snow from building up too much. What would we do without neighbors? Since we are west of Staunton, the winds coming through Buffalo Gap and off the slopes of the Appalachians cause snow drifts across our road. It’s nothing unusual … we’ve been dealing with it as long as we’ve been here. Same with driveways as drifting snow buried them under feet of snow. So our neighbor is just trying to keep the drifts broken up. 5:10am: The power blipped making our smoke alarm chirp and waking us both. Nothing like the threat of no electricity to make you spring out of bed and get moving before it goes out for good. For now (5:30), it’s still on. Mr. Mitchell is cooking bacon and eggs and brewing coffee. 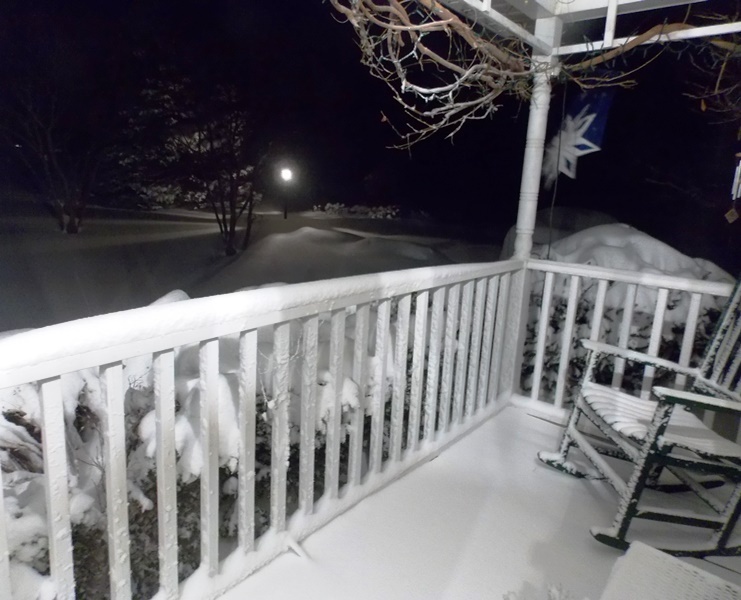 5:35am: The wind began howling last night and we could hear it throughout the night. This morning, it continues. Peering through the snow-caked door onto the deck, the amount of snow has increased significantly overnight. It’s 18 degrees out there with a high of mid-20s expected during the storm today. It appears WHSV TV-3 is off the air — no power? — so the Weather Channel is on and Jim Cantore is reporting live from D.C. I have never live-blogged a snowstorm. However, this is being touted as a possible historic storm with monster amounts of snow predicted — everything from one to three feet — with icing in North Carolina. Virginia is at the epicenter. Blizzard warnings, dire alerts to stay home — not to mention that Virginia is under a state of emergency that was declared before it hit. As a snow lover, I’m excited about the white stuff but also cautious as they call for higher and higher amounts. These are my observations of the storm from our home in the Shenandoah Valley, west of Staunton in Augusta County. 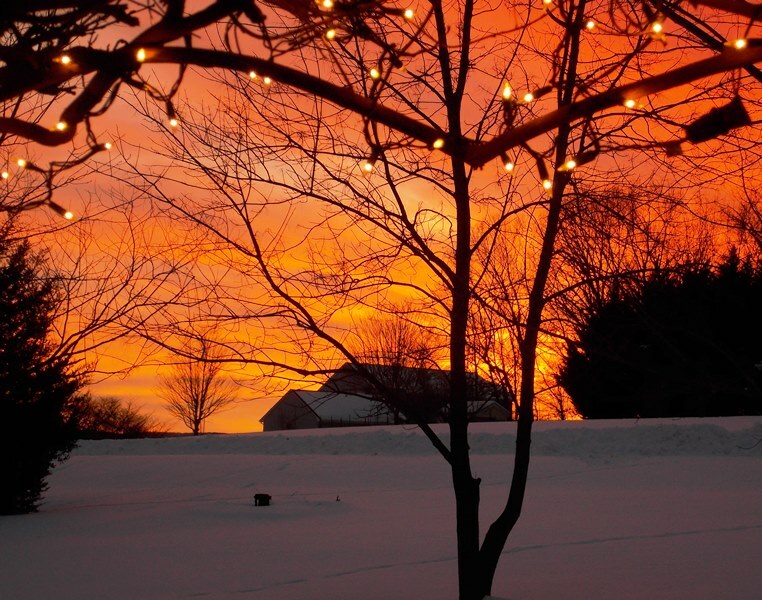 Be safe and warm…. 4:30am: Awake and checking Facebook and weather news outlets for the latest on a storm that has been building all week. Storm is still on track and moving a little faster than originally expected. 6am: Snow flurries reported in Lexington. 6:30am: Snow flurries reported in southern Augusta County. Temperature is 16 degrees.